Cook the chopped carrot, onion and beef mince in a little oil until browned. Add the tomato sauce and salt and pepper. Add the cooked spaghetti and the chopped parsley and stir until mixed. Cut open the tops of the mozzarella balls, and scoop out the middle and add the pieces to the spaghetti mix. 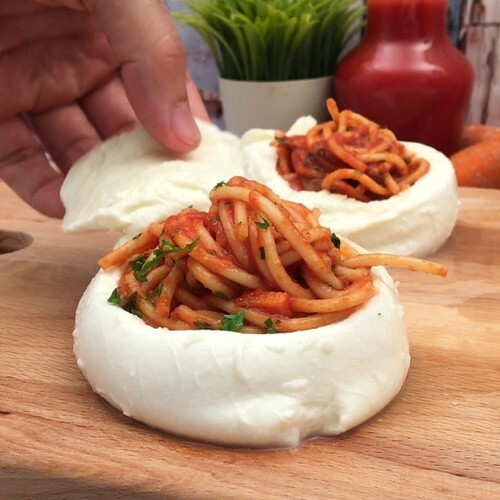 Fill the mozzarella balls with the spaghetti mix. Dip the balls in flour, beaten egg and then breadcrumbs, then fry in hot oil until golden brown. Serve and enjoy hot!